A Brutal Army is Rising! Trolls and ogres plunder the countryside, working together for the first time in generations. During their last alliance, these beasts took part in a reign of terror and bloodshed. At their pinnacle, their numbers were legion, and the free races had only despair. A lone warrior-priestess turned the tide then, but can the heroes haunted by her visions save the land now? Bring legendary heroes and infamous monsters to your Descent: Journeys in the Dark Second Edition game with the Visions of Dawn hero and monster collection. Explore the unique strengths and abilities of these monsters and heroes by playing the included quests individually or through the use of Rumour cards. 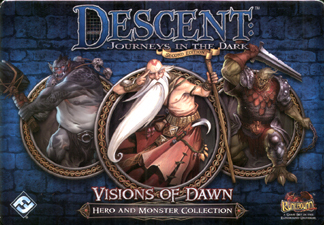 With 4 heroes, 3 monster groups and 2 new quests, the Visions of Dawn hero and monster collection gives fresh options to your Descent: Journeys in the Dark game!